I purchased a DVD player, now, how do I hookup my DVD player? Most new DVD players will have an all digital connection to the new digital HDTVs. This is the best way to connect a DVD player to an HDTV because you get potentially near high definition video plus audio, all in one cable connection. This connection is called HDMI for High Definition Multimedia Interface. Most TV sets sold in the last few years are High Def LCD or Plasma sets with at least one HDMI input port. The newer DVD players will upconvert a 480 standard resolution DVD to near high definition video resolution but can only do this using the HDMI connection. Connect DVD player to TV using an HDMI cable. Select the proper HDMI source input on the TV using the TVs remote. Insert DVD into DVD player, press PLAY and you are all done, ready to watch your video on your TV. HDMI is the only connection you need but there are other options. Some TV sets are not digital and cannot connect using HDMI. Then there is the surround sound option. Most DVDs have surround sound but you need a surround sound system to be able to take advantage of the audio on the DVD. Most DVD players have 3 or 4 video connection options and 3 audio connection options. You only need one of the video hookups to get a picture on your TV. You only need one of the audio hookups to get sound. Basically what you need to do, is get a video signal from your DVD player to your TV so you can see a picture and also get an audio signal from your DVD player to your TV (or Audio/Video Receiver) so you can hear sound. Your disc (movie) contains the video and audio information, and your DVD player will read this data off the disc and send it to your connected TV. Your DVD player OUTPUTS to your TV INPUTS. You need to connect cables from your DVD player output jacks to your TV (or audio/video receiver) input jacks so you can enjoy the picture and sound of the movie. (3) Component video (480, up to 720p, 1080i), three RCA cables colored green, blue and red. (4) HDMI (480, up to 720p, 1080p), newer DVD players have video up-conversion thru an HDMI output. You only need one of above video connections. Usually composite video (1) is the choice for most people because this cable is typically provided with the DVD player. It is YELLOW in color on the cable connector and the jack. if you use a 3 cable component video (3) connection instead, you could get even better video. Your TV however, must have input jacks to accommodate S-Video or component video connections. Most larger new TV sets made today have all these inputs but always check to be sure. If you have an HDTV with HDMI inputs and your DVD player has a HDMI output, then you may choose to connect using HDMI (4), the advantage being better video and the audio is also sent over the same cable. (3) optical (Toslink) digital audio for multi-channel surround sound. Multi-channel surround sound such as Dolby Digital 5.1 requires decoding of the audio bitstream from the DVD, usually performed by an audio/video receiver, and 6 loudspeakers positioned around the listener. HDMI can also be used for surround sound but you need an HDMI connection from DVD player to surround sound processor and another HDMI connection from the processor to the HDTV. The processor can be an audio/video receiver or home theater in-a-box with Dolby Digital 5.1 or more capability. 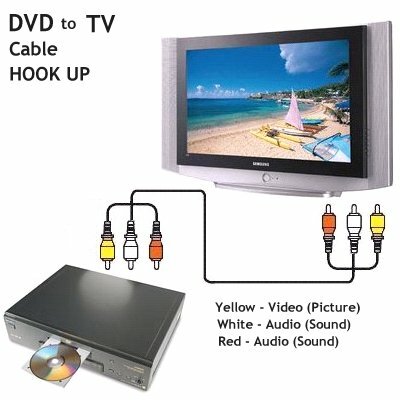 The option for most people would be to connect (plug in) a yellow tip cable (RCA type) into the yellow video out jack on the back of the DVD player and plug in the other end of this cable into the yellow video IN jack on your TV (video IN). This cable may have been included with your DVD player. This cable is all you need for video. 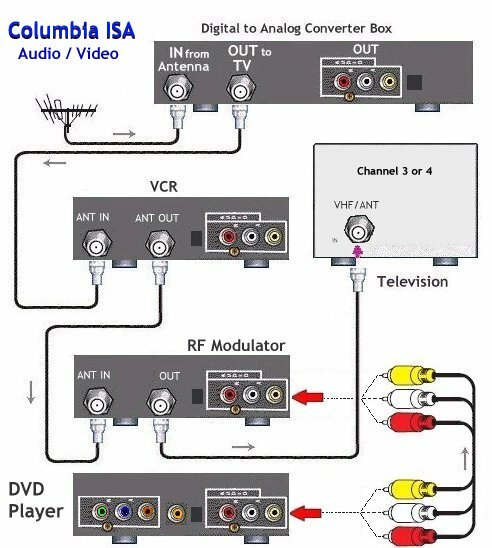 NOTE: If your TV does not have RCA audio/video jacks (yellow, red, white) then you will have to use a RF modulator box in order to hookup the DVD player to the TV. Now for the audio, plug in a white tip cable (RCA type) into the white audio jack on the back of your DVD player and plug in the other end of this cable into the white audio IN jack on your TV (audio IN). For stereo sound you need to also plug in a red tip cable (RCA) into the red audio jack on the back of the DVD player and plug in the other end of this cable into the red audio jack on your TV (audio IN). The white and red audio jacks are next to each other, on the DVD player and TV. You are now connected and ready to go. You need to make sure you have selected the proper source for your DVD player on your TV by pressing the "VIDEO" button (or comparable button) on your TV remote control until you see your DVD player's output on the TV screen. Make sure the DVD player and the TV are both powered ON and you have a disc inserted in the DVD player. Press PLAY on the DVD player. Sit back and enjoy the show! 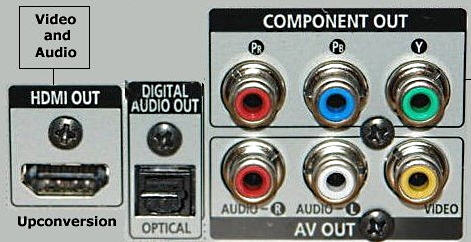 Figure 1: Composite Video hookup from DVD Player to TV. Analog audio (stereo) 2-channel sound connection to TV with stereo speakers. This connection option is how many consumers choose to setup their DVD player and TV since the cables are typically supplied with the DVD player and many TV sets today have A/V input jacks which accommodate this configuration. Although this setup is all you need to enjoy movies on DVD, there are other choices which will give you even better video and audio. stereo (red & white) audio cables. What if I do not have any of these jacks on the back of my TV? For those people who own an older TV set with only a rabbit-ears antenna connection or RF 75 ohm coax (cable TV) connection, and you want to hookup your DVD player, never fear, you can still do it but you will have to buy a device called an RF modulator. These boxes are available locally at your retail stores like Radio Shack or Wal-Mart. They cost about $20 and allow you to connect your DVD player with Composite Video jacks up to your older TV set. With the switch to digital broadcast TV in 2009 you will also need a DTV converter box. 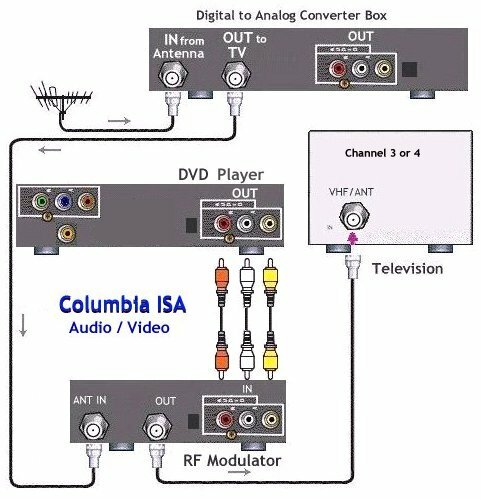 Here is a hookup diagram showing how to connect DVD player, RF Modulator and TV. More on the switch to digital broadcast TV. Need to add a VCR to the mix? This hookup diagram shows how to connect it all up. Set the VCR to channel 3 or 4 and select TV channels with the converter box remote. For more information on RF modulators see RF Modulators and DVD Connections. 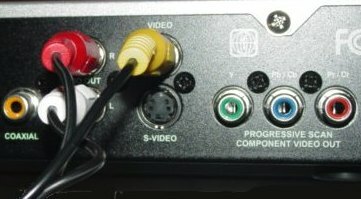 If your TV has an S-Video jack, you can use a 4-pin S-Video cable instead of the yellow RCA video cable to connect your DVD player to your TV. 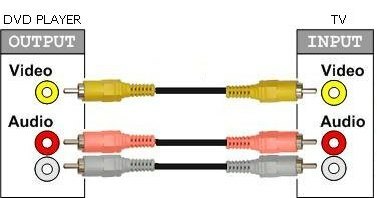 If your TV has the three red, green, blue component video jacks, you can use a three cable (RCA) red, green, blue, component video connection instead of the S-video. Component video is better than S-video or composite video. There are also DVD players now with another option for connecting video and audio. DVD players with a HDMI digital output jack can connect to a digital TV with similar input jacks. HDMI is digital video and digital audio all in one cable connection. Standard DVD has been around since 1997 and provides good video, but the newer Blu-ray disc movies provide up to 1080p video resolution. Blu-ray players also play standard DVD discs. Combining a Blu-ray player with a 1080p HDTV over a HDMI connection, you get the current maximum video crispness available. Colors are deeper and the newer audio is the best you can get. Does DVD give me high definition? Answer: No, DVD is not high definition video. Upconverting DVD players can simulate near HD video but this is not really HD. If you want High Definition then you've got to get a Bluray player and Bluray Disc movies. Can a component video connection give me high definition? Answer: Component video is capable of 720p and 1080i which is high definition, but you would need a Blu-ray player and a Blu-ray disc movie as the source, and an HDTV. Only HDMI is capable of 1080p, the highest current video resolution for HD. Remember, component video is analog (analog/digital conversion required) and starting in 2011, new Blu-ray players will down-rez or limit the video resolution of component video connections. How do I connect my player to get surround sound? Answer: Connect your DVD player or Bluray player to your audio/video receiver or home theater system using either an optical or RCA coaxial, digital audio cable (or HDMI) for Dolby Digital 5.1 or DTS surround sound. For Dolby TrueHD surround sound, you need to use an HDMI cable connection to your A/V receiver or home theater system with decoding capability for Dolby TrueHD. Answer: Dolby TrueHD is the successor to Dolby Digital surround and is a lossless advanced multi-channel audio codec intended for Bluray Disc audio. Answer: Lossless audio compression is in contrast to lossy audio compression (Dolby Digital) where data is lost during compression. Lossless compression allows the original exact data to be reconstructed from the compressed information. You hear the sound as the producer intended, with no loss of data, for an as real as possible audio experience. Is DVD 480i or 480p video resolution? Answer: DVD is capable of storing video at 480i or 480p (or 576 in PAL countries) however most DVDs you find for the consumer market are 480i video resolution. Recordable DVD is also recorded as 480i because of compatibility for the majority of DVD players. DVD arrived in 1997 in the USA when almost all TV sets were designed for analog video (NTSC) using a 525 line interlaced video display standard. This was an interlaced (i) world at that time. For progressive (p) you would need a progressive scan DVD player. — ›› How do I hookup my DVD player using component video? — ›› How do I setup my DVD player for 5.1 surround sound? — ›› How do I hookup my DVD player with a HDMI connection?